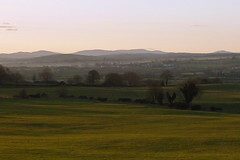 Last week, I was in Northern Ireland, way out west of the Bann in western County Tyrone; a beautiful land of rolling hills, rich farmland and intriguing history. I was there to consider the future of this fascinating place. Not simply the legacy of the Troubles, but the wider issues of what the place may become and what might be its lifeblood in the future. I thought a lot about localism, which – for my purposes – I will describe as sustainable local economies that are rooted in active and empowered communities. This concept has been increasingly suggested as an alternative model of economic development since the credit crunch hit a couple of years ago. A number of things struck me about villages and small towns in the area. Firstly, there are healthy numbers of small businesses, many of which appear to be locally owned. 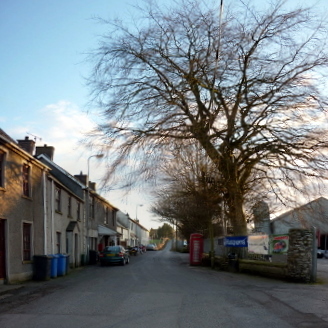 The small town (or large village) of Newtownstewart (population 1,500) has a whole range of such enterprises – Hood and Co furniture retailers, Conways Bar, Ultra Galvanisers, B McNamee building merchants and Newtownstewart Credit Union to name but a tiny selection. 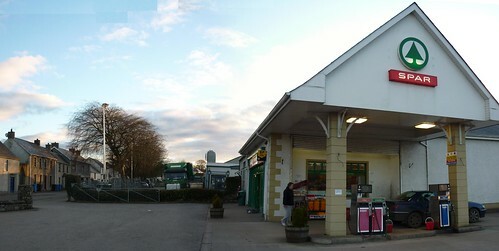 The little village of Ardstraw, meanwhile, has a brand new Spar shop and petrol pumps, a motorcycle shop and garage, and a substantial agricultural merchant’s business big enough to grace an industrial estate in a decent-sized town. All this with a population of just 200 people. I wouldn’t claim that these places have healthy economies and everyone is prosperous and wealthy. But there are more businesses and fewer derelict properties than I am used to seeing elsewhere in many other parts of the UK. The second thing that struck me is the amount of new housing, both within settlements and dotted around the countryside. The number of new houses in the countryside is far more than I’m used to seeing in Scotland and England. The house types and estate layouts might not be to my taste: but that’s not the point. New housing accommodates people, people spend money, and money fuels local economies. When it comes to make high quality, sustainable places, that’s every bit as important as architectural design (although ideally, of course, we’d get the best of both). There will, of course, be a lot more beneath the surface than I have gleaned as a visitor. But I wonder, I hope not too romantically, if this combination of local business and new housing reflects people’s strong attachments to their communities, a pride and a desire to live locally, and to do business with people you know and trust. I then wonder, do these things help to stem population decline, particularly in this relatively remote rural area? And support local employment? And create sustainable communities? Retaining population, strengthening communities, building robust local economies, creating attractive and viable places: few policymakers would argue with these as aspirations for rural settlements. Western County Tyrone is a peripheral economy which faces all of these challenges. But in the absence of it being at the epicentre of massive global investment in biotechnology, international tourism or environmental science – none of which is particularly likely – maybe a more realistic economic future for places like Newtownstewart and Ardstraw is to keep doing what they do; small enterprises, mainly for local markets and locally owned, but with a few whose markets extend further afield. Supporting that kind of local economy won’t grab national headlines, but it might be a good way of sustaining these communities. So, to wrap up: these villages undoubtedly have something to offer policymakers who are interested in promoting localism. Planners might learn new perspectives of supporting place-making and local economies through enabling, rather than restricting, development. Economic development professionals might gain new perspectives on supporting small, locally based enterprises. And if each of those groups of professionals worked responsively and collaboratively with local communities to enable and empower them, the potential for developing a working model of localism is immense. Maybe the economist E.F. Schumacher was right when he said, nearly 40 years ago, Small is Beautiful. the modernisation of Scottish planning | does it go far enough?